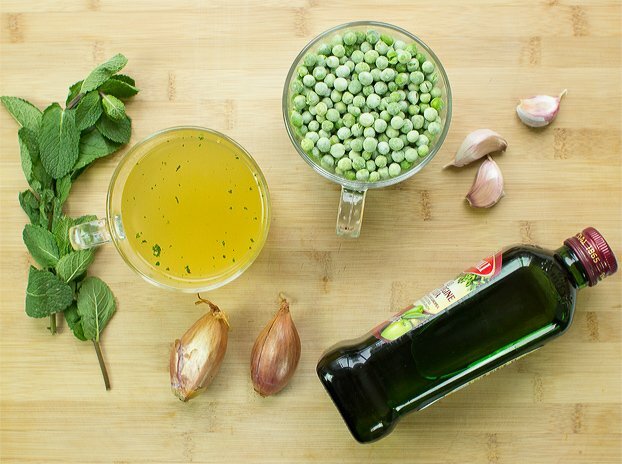 Pea and mint soup has been around for a very long time. It’s one of the first dishes I remember (I’m not that old, I’m just making a point, bear with me) and been has been cited throughout history on countless occasions. Well-known around most of Europe, pea soup comes in various guises. In Germany it’s often eaten with ‘Wienerwürstchen’ (a type of hot dog sausage) or bits of bacon, and usually with dark bread. I won’t pretend to know much about the Scandinavian tradition, but it seems to have been around for quite some time too – and is eaten with pork and mustard followed by baby pancakes on Thursdays. They seem pretty strict about that, so Thursdays it is. 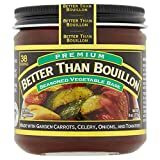 It’s known in North America too – in Canada it originated in Quebec and usually featured salt pork and yellow peas; sometimes dumplings, carrots or turnips. In the US it is said to have come from French-Canadian workers and often had pork, ham and carrots too. Pea soup has quite the pedigree. But the one I’m most interested in is the pea soup known in Britain and Ireland – pea and mint soup to be precise. While many of the other varieties are warming and comforting throughout the cold winter months, this one is light, airy and brings with it the bewitching promise of summer yet to come. It’s fresh and sweet, delicate yet filling. It’s the sort of dish that makes you want to visit the queen then retire to a country cottage and watch cows for the weekend. 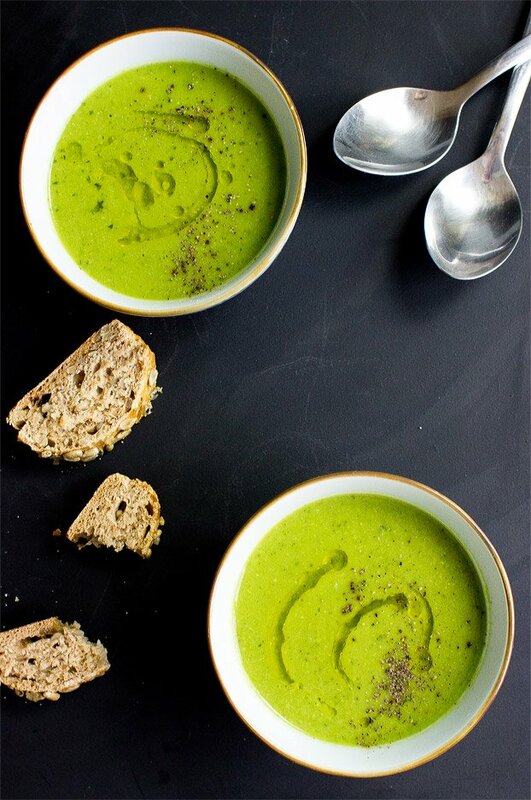 In yesteryear pea soup was a sign of poverty, but hey, times change and the once poor folk’s dish has been revised and realigned to a glorious fusion of sweet peas and gentle mint – it can be found in cafes and restaurants from John o’ Groats to Land’s End. It’s cheap, full of protein, and exceptionally tasty. You can use shallots, white, red or spring onions – whatever you have at hand, really. Each gives it a subtle yet distinct taste that changes slightly by onion. Cook your onions slowly. You want gently softened, near see-through onions, not rapidly fried blackened bits of scrap. 15 minutes of simmering is the perfect time for maximum flavour and efficiency. Don’t tip away any water – that green stuff is nutrients! 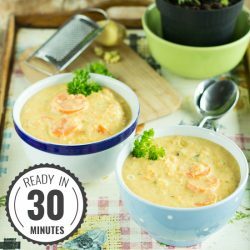 Add less stock at the start – if the soup is too thick just add a little more at the end. It’s a lot harder to get the balance right the other way. Add garlic if you want it – the soup is wonderful with it, but if you don’t want garlic breath for any reason (who does?) then you can skip it if needs be. Fresh mint is best. We haven’t noticed a difference if you add the mint at the beginning or the end, so do as you wish. Technically you don’t need to puree this dish, but to get that smooth, spring feeling we’re after, you’ll want to. A few renegade peas won’t hurt however. Frozen peas are fine. More than fine! If you have the time to spare then shelling your own peas can be fun, but as most peas are snap frozen, you won’t lose any taste or flavour. Small, sweet peas are best – petit pois are a great type to aim for. 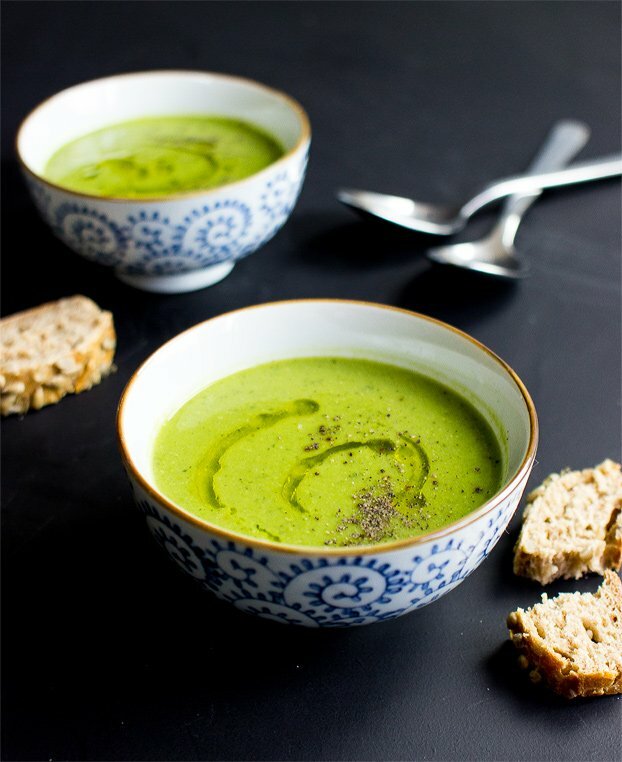 Pea and mint soup tastes equally good, or perhaps even better the next day! So if you have the possibility to make it a day ahead, do so. If you don’t, no wuckers. You’ve still got a beautiful dish ahead of you. 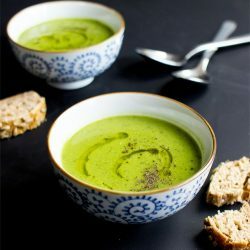 Irresistible Pea and Mint Soup, the classic British dish that’s fresh, light and with the promise of summer yet to come! Finely chop the shallot, mint and garlic. Alternatively blend into fine bits with a food processor. 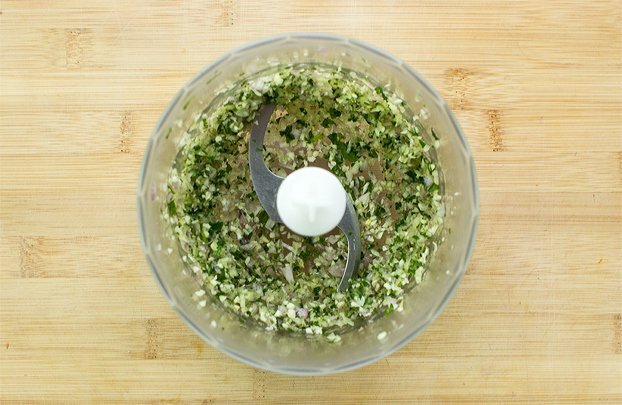 Heat the olive oil over low heat in a small pot and add the mint, shallot and garlic mix. Let it cook softly for about 2-3 minutes, until the shallots turn translucent. Next, add the peas and broth. Give it a little stir and let it simmer for about 15 minutes. 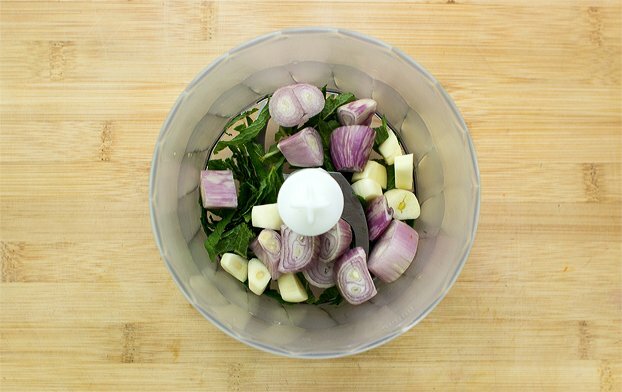 Now blend the soup until it’s creamy, ideally with an immersion blender. Season with salt, pepper and a drizzle of olive oil. 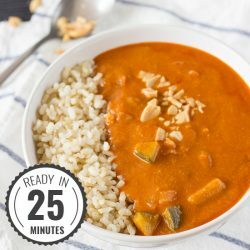 If you liked this soup then you definitely need to check out this Red Lentil Soup, which is similarly easy to make or our Basil and Tomato Soup that is right up that alley too. 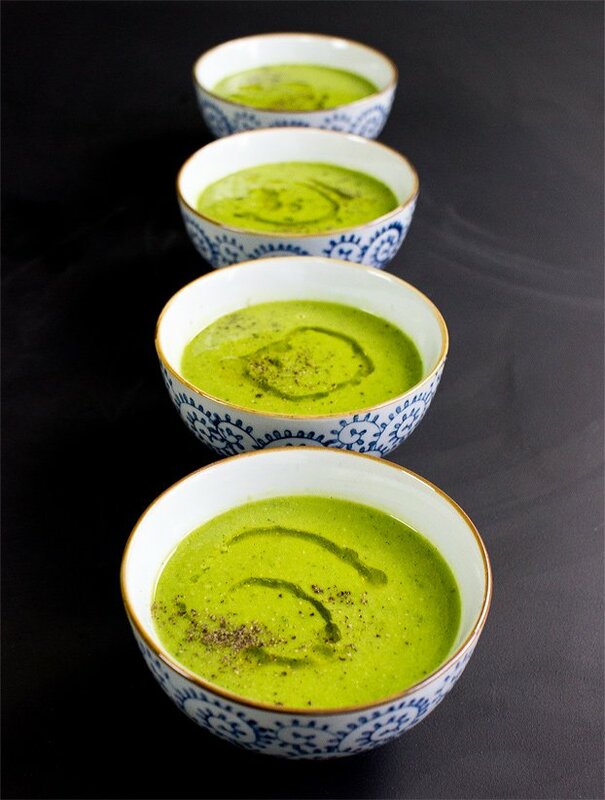 Thanks for this awesome Pea and Mint Soup, Ruthy. We’ll deffo be asking you for more recipes! 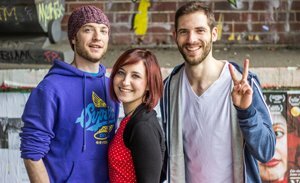 On that note: Ruthy is a professional recipe developer on a similar mission like us: creating awesome recipes for the busy. Of course we got along well right off the bat. Check out her newsletter here. Love how so few ingredients can bring so much big flavor! I love pea soup, especially with a little mint, the flavors are perfect together. This looks and sounds perfect for a light spring meal. Even though this has been around for a long time, I’ve never had pea and mint soup! 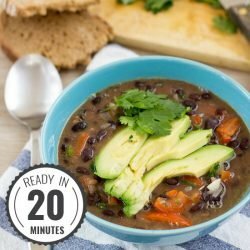 Yours looks like an easy and tasty one to try first – love your bowls! That sounds absolutely delicious. Bowl full of spring goodness!